Shadows and Light Take 3: There’s A Shield Around Us. Casiotone For the Painfully Alone + Powerdove. There was a tube strike beginning any minute and my friend Regis and myself were standing on a street corner apparently one shop number away from the venue we were looking for, but couldn’t seem to spot it. Without hesitation, I asked a guy in a blue hoodie about to walk past us, “Excuse me, do you know where the Luminaire is?” He said it was just ahead of us. My guard was already down, so I asked him where he was from and what his name was. (No, not in the same sentence.) It was Dan, pronounced ‘Don,’ and he was Irish. Cool. We reached the venue and there was no sudden need for any sort of guard to be put back up. For the first two acts, most everyone was sitting on the floor in front of the low stage, and the bartenders were whispering drink prices to the thirsty show attendees. I bought an overpriced bottle of pear cider that had been marketed to me earlier that day in the tube station and took my seat in between a boy twice my size and a girl with voluminous, curly, blonde hair. We had missed Rob Stillman’s set, but were able to catch most of Powerdove. Powerdove’s music is a heartbeat in the dark. It’s getting lost in a tunnel of memories and rediscovering the details underneath the sheets in the morning light. Annie Lewandowski and her accompanier didn’t use words to communicate in between and during songs– only nods and glances sometimes accompanied by a smile. Soon after their set, the positively inevitable happened. 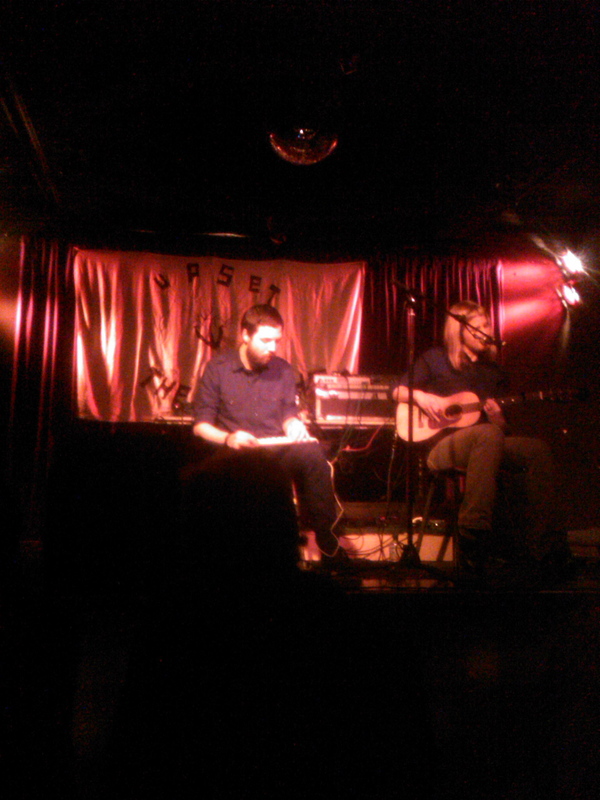 Owen Ashworth of Casiotone For the Painfully Alone took the stage. Casiotone is made up of the thoughts you have in between thoughts. It gives the mundane a melody. A few songs in, Ashworth asked if we had any questions so far. If it was possible to play, he made playing what we asked for a priority. And what made this night a combination of gripping and cozy, besides hearing “Young Shields” played live on Ashworth’s last tour as Casiotone, was bits of the night like this artist and audience conversation. What I’m trying to combat here, is the idea that there is no sense of community in London. Sure, there is. It’s just not holding a sign saying, “Here I am!” on a street corner in somewhere you’re supposed to look, like Soho. The bands that played there tonight, the audience, and the Luminaire hold a piece of it.